Apheresis procedures have been performed since 1950’s for various blood purification and blood component separation purpose. Apheresis is a procedure of blood component separation using centrifugation or membrane filtration technology. This procedure is performed either for donation of a blood component or for treatment of a disease by removal of the diseased or disease causing blood component. Whole blood is extracted from donor or patient’s body, processed through apheresis machine, and the desired blood components are separated based on their molecular weight, size, and affinity for particular substance. The remaining blood is transfused back to donor or patient’s body. Apheresis procedures are performed across the globe for treatment of various neurological, renal, hematological, autoimmune and other disease. In the past few years, apheresis procedures have witnessed a stark rise in the number and areas of applications and the global market for these procedures continues to rise at an excellent pace. Presently, a variety of apheresis procedures are widely used as a part of treatment in various renal, neurology, hematology, cardiovascular and autoimmune diseases. Transparency Market Research states that the global apheresis market was valued at US$1.85 Bn. The market is projected to expand at a CAGR of 10.2% from 2017 to 2025 and reach US$ 4.33 Bn by 2025. In terms of procedure, the global apheresis market is segmented in the report into plasmapheresis, photopheresis, LDL apheresis, plateletpheresis, leukapheresis, erythrocytapheresis and others. Of these, the segment of plasmapheresis dominated the global apheresis market in terms of revenue contribution in 2016, chiefly owing to high number of donor plasmapheresis procedures undertaken every year global and the vast of applications of therapeutic plasma exchange. The segment is also projected account for a notable share in the global market over the report’s forecast period and expand at a CAGR of 8.9% from 2017 to 2025. However, the segment of photopheresis is expected to lead in terms of rate of growth as the segment is projected to exhibit an excellent 12.2% CAGR from 2017 and 2025. The vast technological advancements observed in the field of photophersis in the past few years have led to a vast rise in the procedure’s vast applications in areas such as cancer and hematology disease treatment. From a geographical standpoint, the global apheresis market has been segmented in the report into five regions: North America, Europe, Asia Pacific, Latin America and Middle East and Africa. North America dominated the global apheresis market in 2016 owing to its well-established healthcare infrastructure and high demand for plasma for production of plasma derived medicines. Disposables products segment is anticipated to contribute largest share in North America apheresis market. Asia Pacific, with its considerably established apheresis market in countries such as Japan and emerging economies such as India and China, is projected to witness exponential growth during the forecast period. The regional market is expected to exhibit an excellent CAGR of 11.2% from 2017 to 2025. Factors such as the vast rise in the prevalence of chronic diseases, high geriatric population, and increasing healthcare expenditure in this region will play the key role in upping the demand for apheresis procedures in the next few years. Some of the leading players operating in the global apheresis market are Asahi Kasei Medical Co. Ltd., Terumo Corporation, Haemonetics Corporation, Fresenius Kabi AG, Cerus Corporation, B. Braun Melsungen AG, Kawasumi Laboratories Inc., NIKKISO CO., LTD., Therakos, Inc., and Medica S.p.A.
Apheresis is a procedure of blood component separation, based on centrifugation and membrane filtration technology. Blood components are separated based on their characteristics such as molecular weight, size, affinity for a particular substance, etc. Blood is withdrawn from patient’s body, an anticoagulant is mixed and the blood components are separated based on their characteristics and specific machine criteria. After removal or separation of the desired blood component remaining of the blood is transfused back to the patient’s body. Apheresis procedures are performed to receive the blood components from a donor which is called as donor apheresis or to treat some disease which is known as therapeutic apheresis. Apheresis procedures are performed across blood collection centers and hospitals. The American Society for Apheresis (ASFA) publishes the guidelines for diseases and indications for performing apheresis procedures. Rise in prevalence and incidences of chronic diseases such as multiple sclerosis, cancer, leukemia, etc. has increased the demand for plasma therapeutic products such as immunoglobulin, anti-coagulation factors, albumin, platelets, plasma, etc. In a bid to develop and produce the plasma derived medicines, many of the pharmaceutical and biotechnology industry players are striving for collection of plasma using apheresis procedure or by fractionation of whole blood. These factors has led to rise in donor and therapeutic plasma apheresis procedures driving the growth for global apheresis market. Public and private sector is supporting the apheresis industry in terms of reimbursement and funding, which is projected to uptake use of apheresis across blood collection centers and hospitals. However apheresis procedures are expensive as they incur high capital and operations cost, moreover skilled staff is required to operate apheresis systems which is anticipated to restrain the growth for global apheresis market. Based on product type, global apheresis market is segmented into devices and disposables. Disposables segment which include membrane filtration columns, centrifugation bowls, tubing for blood transfer to and from patient and other disposables. This segment is estimated to dominate the global apheresis market during the forecast period. 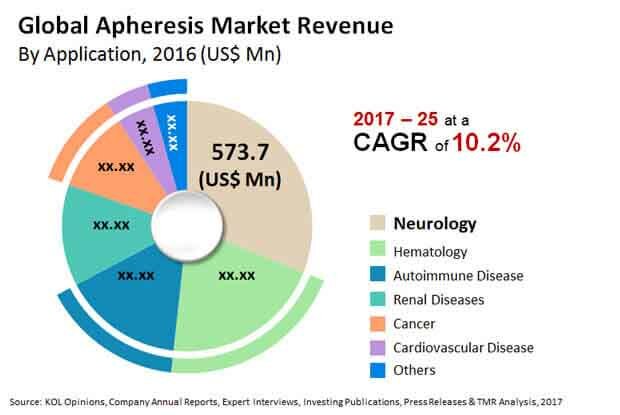 Based on applications, global apheresis market is segmented into renal diseases, neurology, hematology, cancer, cardiovascular diseases, autoimmune diseases and others. Renal diseases applications are wide and include therapeutic plasma exchange, platelet apheresis and many other apheresis procedures. Neurology applications of apheresis are evidence based and are highly accepted. Other application segments includes rare diseases such as babesiosis and overdose of venoms, diabetes and dermatology diseases. By procedure type, global apheresis market is segmented into plasmapheresis, photopheresis, LDL apheresis, plateletpheresis, leukapheresis, erythrocytapheresis and others. Plasmapheresis is most widely donor and therapeutic apheresis procedure and is projected to dominate the global apheresis market. Other segment of apheresis procedure include procedure such as lymphapheresis, hemopoietic stem cell extraction, and other apheresis procedures. Based on technology, global apheresis market is segmented into centrifugation and membrane filtration. Centrifugation based apheresis systems are widely used in North America and Europe region. These systems are more efficient and offer modularity in performing therapeutic apheresis procedures which is projected to drive growth for this segment. By end-user, global apheresis market is segmented into hospitals and blood collection centers. Blood collection centers are further classified into public and private blood collection centers. Public blood collection centers are projected to hold largest share in global apheresis market. Rise in demand for therapeutic apheresis procedure is expected to increase apheresis base in hospitals across the globe. Based on geography, global apheresis market is segmented into North America, Europe, Asia Pacific, Latin America and Middle East & Africa. North America was the largest market for apheresis and is projected to continue its dominance during the forecast period from 2017 to 2025. The U.S. contributed largest share in North America apheresis market in 2016. Asia Pacific region is projected to grow exponentially during the forecast period from 2017 to 2025. High prevalence of chronic diseases and increasing healthcare expenditure in emerging markets such as China and India is likely to propel this growth. Europe is projected to hold prominent share in global apheresis market and grow at strong CAGR during the forecast period from 2017 to 2025. The report also profiles major players in the market based on various attributes such as company overview, financial overview, SWOT analysis, key business strategies, product portfolio, and recent developments. Key companies profiled in the report include Asahi Kasei Medical Co. Ltd., Terumo Corporation, Haemonetics Corporation, Fresenius Kabi AG, Cerus Corporation, B. Braun Melsungen AG, Kawasumi Laboratories Inc., NIKKISO CO., LTD., Therakos, Inc., and Medica S.p.A.